You’ve probably heard of 3D printing. It was supposed to be the new “Industrial Revolution.” People would be able to fabricate anything in their own homes! An upgrade for your car could be printed in a matter of minutes. It hasn’t taken over the world just yet, but I’m here to talk you through everything you need to know to get started. This guide is available to download as a free PDF. Download Ultimate Beginner’s Guide to 3D Printing now. Feel free to copy and share this with your friends and family. Before getting started, let’s clear one thing up. It will not be plug and play! No machine is without issues, or requires no maintenance or work. It’s not always the easiest hobby, but it is very enjoyable. If you are still interested, then read on. If you want all the benefits of 3D printing (without any of the hassle), look into online printing services 3D Hubs and Shapeways. 3D printing is a form of additive manufacturing. Objects are built in small layers, stacked on top of each other one at a time. It can be quite a slow process, but it does have many benefits. For comparison, a subtractive manufacturing process starts with a solid block of material, and removes bits until the final product is born. Some examples of this are marble sculpting and CNC milling (that’s computer numerical control). 3D printers are technically a type of CNC machine, but they are rarely referred to as such — it can get confusing! 3D printing has been around for a long time. 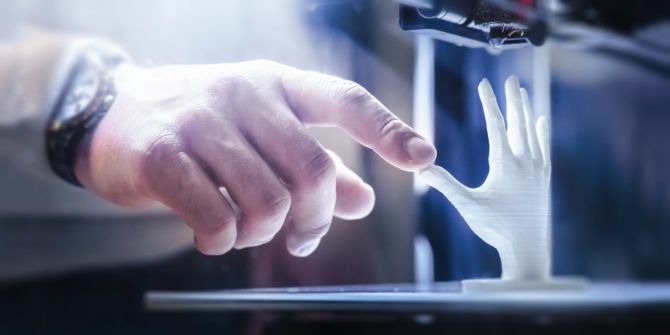 Ever since the 1980s, designers and engineers have had access to commercial 3D printers — these often cost tens of thousands of dollars, and sometimes mandate expensive support contracts for routine maintenance. The recent explosion of “hobby” 3D printing has occurred due to a patent expiry. 3D printing techniques will continue to grow as more patents expire in the near future. Nowadays you can buy a 3D printer for your home for around $1,000 or less Skriware 3D Printer Review Skriware 3D Printer Review After a successful Kickstarter campaign, Skriware have brought a new 3D printer to market, which aims to be as consumer friendly as possible. Read More . Take a look at this model of the Eiffel Tower. Notice how it emerges as the bed moves down. This is fairly representative of what 3D printer models look like. Before digging too deep into 3D printing, here is some common jargon you may encounter along the way. Filament — A material (often plastic) manufactured into a long strand (like a cable). These are used by some types of 3D printers to manufacture objects. Extruder — The part of the machine where the material is melted. Nozzle — A small hole from which melted filament is pushed (“extruded”) out of. Bed — The surface on which a 3D printed object is produced. Heated Bed — A print surface that is heated to provide better adhesion. Stepper Motor — A precise and powerful motor used to move the various parts of a printer. RepRap — An open source 3D printer movement. G-code — Instructions for a machine describing every movement required to manufacture a part. Not specific to 3D printing. Slicer — A piece of software used to convert 3D models to G-code. Axis — A reference line for movement. A 3 axis machine can move in X (left to right), Y (front to back), and Z (up and down). Carriage — A moving part that the extruder sits on. Nearly anything! 3D printed parts won’t be replacing traditional manufacturing techniques for mass production anytime soon — no printer is fast enough, or capable of producing the required quality. Where 3D printing really shines is in the prototyping and home production markets. Say the dial on your washing machine breaks, and the manufacturer quotes your $30 for a tiny piece of plastic plus shipping. Why not design your own replacement and be up and running within a day, at a fraction of the cost? Take a look at these ways you can make use of a 3D printer 6 Ways To Make Use Of A 3D Printer At Home 6 Ways To Make Use Of A 3D Printer At Home Let's say you had a 3D printer set up next to your computer right now, what could you realistically make with it today? Here are some ideas. Read More at home for some more inspiration. There’s a reason the Ford Motor Company have 3D printed over 500,000 prototype car parts 500,000 prototype car parts. Having the ability to modify a component and then print it again is a huge time saver — even if that part takes five hours to machine, it’s still a very quick process. There are fun things too, like these six games you can print at home 6 Coolest Games You Can 3D Print at Home 6 Coolest Games You Can 3D Print at Home Everyone knows about 3D printers, but what you might not know is how fun 3D printing is, and how much fun it can create for your whole family. We're talking 3D printed tabletop games. Read More . Now that you know what 3D printing is, let’s look at the different types of machine. There are two types of printing process: Fused Deposition Modelling and Stereolithography. These have their own strengths and weaknesses, so here are the basics. Fused Deposition Modelling, or FDM, is the simplest and most popular method of printing. The printing material is pushed through a hot tube. This tube is pushed around to draw the required shape, just like piping a message onto a cake. The temperatures vary depending on the material, however 200C/392F is about average for consumer machines printing in plastic. This is currently the most popular printing process. Prices range from $200 up to several thousand dollars. There are a myriad of different manufacturers and models for FDM machines. They print plastic in layers, each building upon the previous, lower layer. Machines start at the bottom and build upwards. This can mean complex shapes or objects without a flat axis on which to start may be difficult to produce. Models often have “lines” where each layer has been built. This can be smoothed afterwards if required. Approximate cost per 1kg/2.2lbs of material: $25. Stereolithography (SLA) is very different to FDM. This starts with a container of special liquid plastic (known as photopolymer resin). An ultraviolet laser is directed at the top of the resin, causing it to solidify (not the whole lot, just a small layer). Just like FDM, each layer is “drawn” and cured successively. These machines work from the top down, pulling the object out from the liquid. Models produced using SLA are extremely smooth, with an incredibly high resolution. They are faster to print than FDM machines, however they are less common, more expensive, and rely on expensive resin. Approximate cost per 1kg/2.2lbs of material: $100. Prices vary per model, although the average is a lot higher than FDM machines, approximately $1,500. This guide will focus on FDM machines, due to their relative ease of use, and popularity. Aside from the manufacturing process, there is one other critical specification to know: the coordinate system. This is how each printer moves the hot end around the bed. The two main variations are known as cartesian and delta. There are other systems (like polar), as well as several unique designs, although it is best to stick to a popular system. Using a coordinate system that several thousand other people have used makes it much easier to troubleshoot any potential problems. Delta printers also utilize X, Y, and Z axis, however there is one important difference. Delta machines suspend the extruder from three arms in a triangle arrangement. They will nearly always have a circular print bed that does not move. These machines were designed to print parts fast! They are perfect for tall, narrow models. They are only slightly more expensive and complex than traditional cartesian machines, so they represent an excellent alternative choice. Just as there are hundreds of different printer styles, sizes, and prices, there are dozens of printing materials (filament for FDM machines). The main two you should focus on right now are ABS and PLA. There are other materials gaining popularity (Nylon for high strength, and wood-based for different textures), however these are not always as simple to use. Polylactic acid (PLA) is a biodegradable plastic derived from renewable resources, such as sugarcane or corn starch. As a result, printing with it gives off a semi-sweet smell. It is one of the easiest materials to print with, while still maintaining high strength. PLA can be “stringy,” making it prone to clogging. Ensure you follow any and all manufacturer recommendations. ABS, or Acrylonitrile butadiene styrene, is the stuff Lego bricks are made from. Derived from fossil fuels, it is strong, and hard wearing. It is not biodegradable, and printing with it can give off a strong “burning plastic” smell. While it can be challenging to print with, it is still one of the more popular material choices. A heated bed is often required to prevent warping and poor bed adhesion. Parts printed with ABS can be sanded and smoothed quite easily. Both PLA and ABS can be purchased in a wide variety of colors. PLA can be found in partially translucent colors if required. FDM machines use plastic in filament form. Often provided on reels or spools of 500g (1.1lbs) to 1kg (2.2 lbs). When making a decision, it’s important to choose the right machine for you and your needs. Are you buying the cheapest model on the market? Are you buying the most expensive one? What’s the customer support like? Is there an active support community, of which users may have solved common problems? 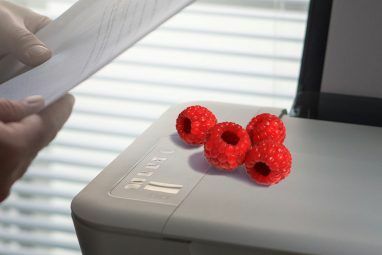 Choosing a printer should not be done on a whim, or the spur of the moment. I have owned three 3D printers, and deeply regret purchasing my first one, for reasons outlined below. One important factor to consider is maintenance. Most machines use a belt driven X and Y axis, with a lead screw driven Z axis. Not all machines operate like this, but it is a fairly common design choice. Belts need to be calibrated and tightened, so if there is no way to do so, maybe that model is not the best choice for you. My first machine was reasonable, however, over time the belts worked loose, and regular maintenance and calibration was needed (as is the case with all printers). When I went to tighten the belts, there was no way to do so, and the manufacturers had ceased trading. Not only that, but as there was no community around this machine, there was not a lot of information about this particular design. This leads to another important factor: community. With many of the popular models, huge online communities exist, often with solutions to common problem. This information is invaluable to improving the quality of your prints, and maintaining your printer. The final important feature to consider is cost of running. As shown above, filament is reasonably cheap to purchase. Many different manufacturers produce a whole range of materials and colors, for nearly every use and budget imaginable. A few select manufacturers have attempted to introduce proprietary filament “cartridges,” which lock you into only purchasing filament from that company. This is great at making money for the company, but a terrible deal for consumers. I recommend you stay away from any machine that forces you to use a proprietary filament design. The RepRap project is an open source 3D printer movement. Many of the machines use 3D printed components, and the rest are readily available (usually in hardware stores). The RepRap community is huge, and many problems have been resolved thanks to this community. A RepRap is one of the best machines you can purchase. Not only is there a massive support community, but there are many tried and tested designs. Machines can be bought in kit form, or fully assembled. Hundreds of retailers sell their own take on popular kits, and replacement parts as well as upgrades can be cheaply purchased from Amazon or Ebay. Many kits are sold at a very low price. While some of these may not be bad in themselves, poorly assembled components or cost cutting in the wrong places (such as the power supply), can lead to trouble. 3D printer fires are rare, they do happen, and while any 3D printer has the potential to cause a fire, this risk can be reduced by purchasing from a reputable retailer, and choosing a machine that has good reviews on the whole. If you are going to purchase a RepRap, I recommend the Prusa I3 MK2 from Prusa Research. There is a vast number of users, with hundreds of modifications and improvements available. This particular printer is available in kit or pre-built form, and is highly calibrated. Prusa Research designed the Prusa models themselves, and while this is not one of the cheapest machines around, the design and configuration in this machine really will save you a lot of trouble later on. Now that you have chosen a machine, and it’s been delivered and setup, it’s time to start printing! I’m afraid buying the machine is only the start of the process. Most machines run off an SD card, or your computer. You could install Octopi, a Raspberry Pi Distribution written for 3D printing, but that’s a bit advanced for today. Learn the basics first, then you will know everything you need to configure an internet controlled printer. Design or obtain 3D model. Convert 3D model to STL format. Use a “Slicer” to convert STL model to G-code. Make sure you read our introduction to Sketchup Design & Build 3D Virtual Buildings & Objects With Google SketchUp Design & Build 3D Virtual Buildings & Objects With Google SketchUp Google SketchUp is the backbone modeling program for Google BuildingMaker, which allows graphic designers to submit building designs to Google to be added to the official Google Earth imagery. Read More first. Blender is another excellent tool, and one that is slightly more geared towards artwork, rather than product design. Checkout our compilation of fantastic tutorials Getting Started with Blender: 7 Fantastic Tutorials for Newbies Getting Started with Blender: 7 Fantastic Tutorials for Newbies 3D modeling is an excellent way to exercise creativity while keeping in touch with your technical side. Here are some awesome free tutorials. Read More for Blender beginners. Now that you have a model to print, it needs to be converted into the STL format. This stands for STereoLithography and it is a fairly universal 3D model format for 3D printing. Many tools can save files in this format. Nearly all Thingiverse files can be downloaded as STL. If you are using Google Sketchup, you will need to download the sketchup-stl extension to be able to export STL files. You may have heard of a slicer. These pieces of software convert your STL file into a set of instructions called G-code. G-code has been around for a very long time and is used on industrial machines as well as 3D printers. G-code will often be specific to your machine. There are many different slicers available. They mostly function the same, and when you’re just starting out with simple models, it does not really matter which slicer you choose. The manufacturer of your machine may recommend one, and even better if they provide a default or getting started configuration file! There are many settings in your choice of slicer. Here are some common ones and what they do. This determines how thick each layer is. A lower number results in more layers, and a higher quality print (at the expense of speed). A good tradeoff is 0.15 or 0.2mm. Very high quality prints may use a 0.05mm layer height, but this will be very slow! It’s often advisable to use a slightly thicker height for the first layer, as this helps things stick better. This is how thick the outer walls should be. You will want this to be a decent size, otherwise the fill may show through. Anywhere between two and four wall thicknesses would be good, depending on your model. Retraction helps to keep prints neat by slightly pulling the filament back into the nozzle when not printing (ie, when moving across a gap in the model). It can sometimes be difficult to fine tune, so stick to the default or manufacturers recommended setting. 3D printed objects are rarely 100 percent solid on the inside. This is done to save plastic, and increase printing speed. The top and bottoms layers are solid, so you can specify how thick these should be. Six layers is a reasonable number. Go too low and you may notice the semi-hollow fill showing through or bubbling on the surface. Expressed as a percentage, this is how solid the interior should be. Model designers will usually specify this figure, as some parts may require a higher strength fill. A value of 20 percent to 30 percent will usually be sufficient. Temperature is another setting that has a big impact on quality. Unfortunately, it varies based on a lot of factors. Maybe your thermistor (digital temperature reader) is only accurate to +/- 5 degrees. Different materials have different printing temperatures, and even different colors and manufacturers of the same filament can vary in ideal temperature. Start with your slicer defaults (approximately 210C for PLA, 230C for ABS). If the temperature is too hot, models may look squished, or possibly even burnt. Reduce the temperature 5 degrees at a time until a good level is found. You may have to do this for every different filament you use. If your machine has a heated bed (not all of them do), then set it to the slicer default. Heated beds are required for printing in ABS, but are not always needed for PLA. Heated beds keep the bottom of your prints warm (usually about 70C). Without a heated bed, you may find the bottom of a large part cools, and becomes unstuck. This is called warping, and if the part becomes 100 percent unstuck, the print will usually be ruined. Think of a traditional printer or photocopier: how would the ink be in the correct place if you wobble the paper around? Support is another setting you may not initially need. If you are printing a complex model, maybe a figure or curved object with overhangs greater than 90C, a support structure is needed to hold up the parts that will not print otherwise. Think of it like scaffolding for 3D printed parts. This often leaves minor marks on prints that need cleaning off. Support is not needed for simple shapes and calibration parts. In the image below you can see the support structure as a concertina of thin plastic. There are two main adhesion types here. The first is a raft and is exactly as it sounds. This prints a small raft first, and then prints your model on that. This reduces problems with an uneven print surface. Rafts were widely used when hobby 3D printing first started, but now that machine quality has improved dramatically, they are not often needed. Brims are still used regularly. These are like a skirt or outer layers on your model. They increase the surface area, and can help to reduce warping. They are usually only one or two layers high. Filament is mainly sold in two diameters: 1.75mm and 3.00mm, with 1.75mm becoming increasingly common as it is quicker to heat up. Your printer will be designed for one size only. It’s not possible to mix different sizes without changing the hotend and extruder. Nearly all filament sold has some variation in its diameter; higher quality filament has less variation. Filament with a wildly varying diameter may work inconsistently, and possibly cause clogging. This filament diameter setting allows you to tweak the exact diameter of your filament. Measure your filament diameter in three places across one meter and average the results. Enter this average diameter. Flow percentage is used to adjust how much plastic will come out. This will be 100 percent by default, but you can increase or decrease this as required to reduce over extrusion, or fix under extrusion. Most machines come with a 0.4mm nozzle size. A smaller nozzle will increase print quality, but at the expense of speed. 0.3mm nozzles are becoming more common. It does not really matter what size nozzle you are using, just be sure to enter the correct size here. If you are not sure what you should start with, many slicers come with default templates for common machines. If you own a popular model, a quick Google search for “Printer model slicer settings” may yield many results. This is where your machine research may have paid off. 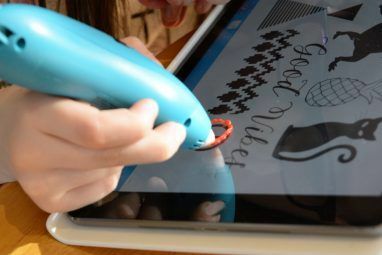 A printer with very good support, or a large community may mean you can download someone else’s settings, or maybe your manufacturer even supplied the settings — some of them do! This video shows off a very high quality print. Similar to having a smaller layer height, a smaller nozzle can help to improve quality (but it’s not the only way). Your slicer will generate G-code. This is a set of instructions for your machine to print the model. This is often specific to you, and contains your settings at the time. The final step is to print your model. You need to upload the G-code to your printer. This is often done directly over USB, although many printers will run G-code from an SD card. I like to keep my SD cards neat and tidy. I create folders for different projects, and prefix my G-Code files with an estimated print time, along with any specific print notes. Make sure you delete any G-code that produces undesirable results. Most slicers will provide an estimated print time, along with filament usage and rough cost. Hopefully by this point, you will have a working 3D printer, and a good knowledge of how it operates. One of the most challenging issues is that of warping. Even on perfect machines it still happens. The main cause of warping is bed adhesion. Sometimes a corner comes unstuck from the bed, and “curls”, ruining an otherwise perfect print. ABS can be particularly troublesome for warping. Reduce the first layer height. How far away is the nozzle from the bed? Turn on the heated bed. The part may be cooling at the bottom too rapidly. Add a brim to your model. Try adding mouse ears to your model. Sometimes, warping happens even when you do everything right. Some of the most difficult parts to print are those that are large and flat. These can warp even with perfect adhesion and settings. What happens here is a result of contraction. The top of the print cools at a different rate to the bottom. This is enough to be a problem on certain prints. A heated bed helps a lot with this, or you can use a hair dryer to heat and then slightly bend your part after the fact. Why not consider a DIY project for your new printer? 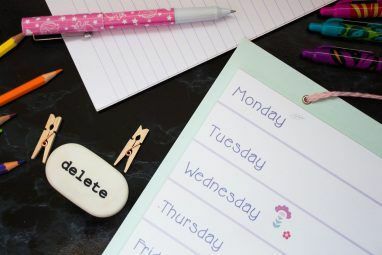 Checkout our DIY shortcut buttons Make Your Own Custom Shortcut Buttons With an Arduino Make Your Own Custom Shortcut Buttons With an Arduino The humble Arduino can do a lot of things, but did you know it can emulate a USB keyboard? You could combine long keyboard shortcuts into a single custom shortcut key, with this simple circuit. Read More or an electronic D20 Die Roll in Style With This DIY Electronic D20 Die Roll in Style With This DIY Electronic D20 Die Want something a little unique at your next gaming meetup? Check out this DIY electronic D20, featuring custom graphics for critical hits and misses. Read More — two projects that use 3D printed parts! You should now know (nearly) everything you need to get started 3D printing! What printer are you using? What common problems do you encounter? Let us know in the comments below! Explore more about: 3D Printing, Longform Guide, Printables.